Hectic, hassled lifestyles mean more and more people are only interested in food that they can get fast. No cooking, no dishes, no hassle. Eating fast food usually means eating processed foodstuffs dipped briefly in a deep fat fryer and served in paper or cardboard. There is no reason why fast food should not be healthy though, or that healthy food should not be fast. With the right ingredients and a little planning, delicious healthy dishes can be knocked together with only a few minutes actual attention. The amount of time spent intensively working on any meal being cooked is usually more relevant than the start-to-finish cooking time. Baked potatoes might take longer to come to the table than risotto, for example, but getting them right requires a lot less active participation. The ultimate in fast food dishes has to be the stir-fry. Provided you have ample warning, you can cook off rice, quinoa or any other cereal in advance and have it ready to add at the last minute. Any large steep-sided frying pan is good for stir-fries although, as with all pans, the heavier the better. A heavy pan distributes heat more evenly and is less prone to burning food. Woks are useful because ingredients requiring more heat can be steered to the centre while those that are closer to being done can be pushed up the side of the pan away from the highest temperatures. In commercial kitchens, each chef is responsible for their own mise en place. This refers to all the produce they will require for a shift washed, peeled and chopped in advance to facilitate the rapid assembly of complex dishes under pressure. In order to do stir-fry right, something similar is required of the home kitchen. Stir-fries can be cooked so fast because time has been spent preparing the ingredients to cook quickly. Five extra minutes of chopping here can cut cooking times by fifteen minutes. How to chop the ingredients depends on which order they will go in the pan. Mushrooms, for example, could be roughly quartered so they can go in earlier and be more thoroughly cooked. Carrot might be julienned (matchsticks) and added last so that it is hot but still crunchy and hardly cooked at all. The spice trinity of ginger, garlic and chillies should also be present, diced in the brunois style (2mm cubes). The best way to learn what works is to experiment with a range of cut sizes for different ingredients. If using any kind of meat or fish, extra flavour can be introduced through a marinade. A couple of hours before cooking, slice the meat in strips, mix in some of the ginger, garlic and chillies, and douse the whole lot in spices, sesame oil and soy sauce. Then cover it and leave it to sit until you need it. 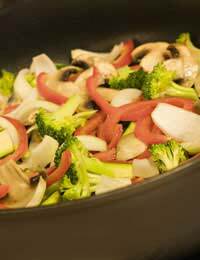 Something to bear in mind when stir-frying is that every time cold ingredients are added to the pan the temperature falls. If too many ingredients are added at once, the cooking process will be drastically slowed so it is best to allow a minute or two for the heat to return between each addition. When it’s time to start, make the stir-fry pan hot, fry some chopped onion for a couple of minutes and add some spice. Once those are hissing nicely, start pitching in the ingredients in sequence according to their cooking time. Meat goes in first. Beef or lamb can be cooked rare if cut from steak but chicken and pork need to be thoroughly cooked. All this means is that if you are cooking good red meat or fish then continue adding other ingredients immediately, if any other kind of meat let it cook a little in the pan first. When all the vegetables are in you can add the rice, stirring it gently into the mix one spoonful at a time. When everything is cooking, you can add sauces. Sweet chilli is one of the most popular but can be very sugary. An excellent Indonesian sweet soy sauce called Kecap Manis makes a delicious alternative. Unless you are making mammoth volumes, the actual cooking bit should take no more than five or, at the most, ten minutes from the first ingredients hitting the pan to the finished product being spooned into deep bowls.